The back cover of this chunky book has an interesting photo of John Baeder standing next to his 1975 'The Magic Chef' painting (part of it is on the front cover, too) interesting because it graphically shows how big the canvas is at thirty by forty-eight inches wide. I only mention it because as you look at the paintings in the book they seem even more photographic and magical because of the reduction from the originals, some of which are seventy inches wide and displayed no more than nine inches on the page, nicely none of them run over the gutter. After many years as a Mad Man, Baeder started his diner painting career at New York's Hundred Acres Gallery presenting his first show in September 1972. Surprisingly some of his early work, of historic street scenes, is oil on canvas but in black and white, five of these are in the first few pages. Another pleasant surprise are many examples of his photography (the obvious reference point to create the paintings). Some from the sixties show close-ups of amateur signs, others are what might be called American commonplace: gas stations; drive-ins; storefronts; motels and of course, diners. Thirteen black and whites intrigued me, taken in a poor section of Atlanta on one day in March 1963 and looking like those remarkable FSA photos of the Depression years. There are page after page of wonderful diner paintings (I counted 125 of them) and other works showing food vans, restaurants, Las Vegas street scenes and diner ephemera. So many of the diners seem like a labor of love because they contain extensive brickwork, all carefully executed. Even harder is the lettering, whoever saw a diner without a Coca-Cola or Pepsi sign, both names have repeat letters that must look absolutely identical to the original signs. The diner is the obvious focal point in all of Baeder's work but it's worth having a closer look at the sky and foliage, green leaves or just bare branches and skies that have a few clouds or fiery red sunsets they all blend seamlessly with the diner. Photography has obviously been an important part of Baeder's creativity and in a chapter called The still lifes: an inner road trip there are nine exquisite still life tableaus of historic model cars with backdrops of flowers, fruit, ceramics and covers of period books. These photos taken from 2011 onwards are part of the artist's move away from diners, the final series of these might be called diner-lite, the structures painted head-on and minus cars and street scene detail that were so much a part of each painting over the previous forty years. The last chapter reveals that Baeder has taken to the air by painting vintage aircraft based on a large collection of photos he kept as a teenager. The nine shown are paintings done in an almost mono style of black or sepia, accurate to the original photos. 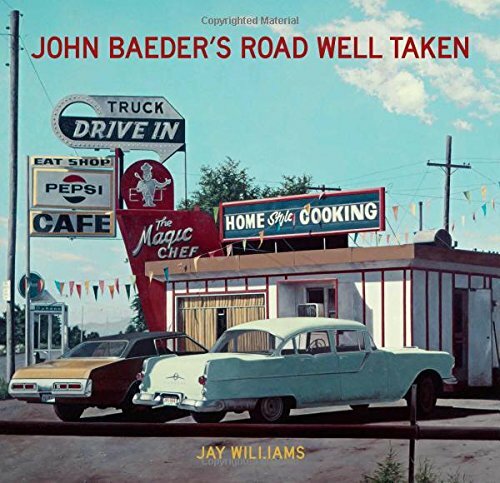 I thought the book was an excellent overview of Baeder's life and mixed in with the three hundred images Jay Williams writes an honest and heartfelt biography of the artist. Printed on a reasonable matt art using a 175 screen with Laura Lindgren's design adding to the overall appeal of the book.